In the complete third series of the multiaward-winning show, from the makers of Cabin Pressure and Armando Iannucci’s Charm Offensive, Marcus Brigstocke examines different facets of life by being put in charge of them. Each week he starts out by thinking, Well, it can’t be that difficult, surely and ends up with Oh, turns out it’s utterly difficult and complicated. Who knew...?. Joining him are regular guest stars William Andrews (Sorry, I’ve Got No Head) and Margaret Cabourn-Smith (Miranda) as well as special guests Justin Edwards and Colin Hoult as they tackle the ills of British society. In the first episode, Marcus decides to take his local football team all the way to the top of the Premier League. He finds out about the pure, noble and honest game of football - and FIFA. In show two -“Being a Woman” - Marcus has decided to cross the gender gap and become a woman. Expect a clear-eyed assessment of sexism and a doubling of the bathroom candle budget. Ahem. In show three, Marcus coughs politely, dons a crumpled linen suit and fibs for Britain as he tries his hand at becoming a diplomat. On the way, he’ll look at the history and origins of diplomacy. In the nicely furnished, affordable show four with very attractive views, Marcus decides to solve the housing crisis. He’ll also be building a basement under the studio and knocking down a party wall he shares with the Archers. Good Lord - is exactly what Marcus has become in show five in order to peer under the ermine and see if we really do need that second chamber.... Along the way he’ll be looking at the history and function of the House of Lords and having a good old rummage in the Woolsack. Please turn your radio over and start listening as, in the final show, Marcus has 30 minutes to retake his GCSEs. Great series. Marcus Brigstocke is smart, funny and irreverent. Great support cast too, especially Justin Edwards and Margaret Caborn Smith. People at work keep looking at me! 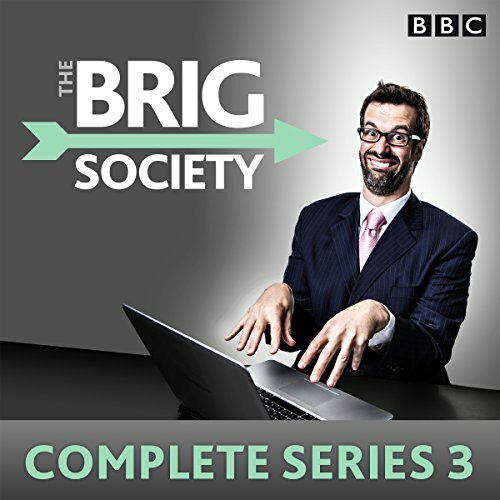 If you could sum up The Brig Society: Complete Series 3 in three words, what would they be? What was one of the most memorable moments of The Brig Society: Complete Series 3? Brigstocke doing his GCSEs, though my favorite episode was on the house of Lords. The combination are slick, well edited and nicely recorded. BBC turns popular radio show onto the TV/Screen, who'd have thunk it would do it again. Do the first two series first, they are certainly superior, this one feels like its running a little low on material.